The Earth's atmosphere is a layer of gases surrounding the planet Earth that is held in place by the pull of Earth's gravity. We call our atmosphere 'the air'. The atmosphere is held onto by planet Earth by the pull of gravity. Planets and moons with a weaker gravitational field than Earth's have thinner or even no atmospheres. The gases just escape into space. We are lucky that our planet has a strong enough graviational field to hold onto the life giving gases. water vapour (average of 1% - but that varies). The atmosphere protects life on Earth . It is deep enough to absorb X-rays and gamma rays from outer space, preventing them from reaching ground level at all. The ozone layer absorbs ultraviolet solar radiation. The atmosphere acts like a blanket over the Earth, reducing temperature extremes between day and night - making it easier for life forms to survive. The atmosphere absorbs and reflects some of the heat radiation from the Sun. This prevents the Earth’s surface from getting too hot during the day. It retains some of that energy so that all of the energy collected from the Sun is not lost during the night (as would be the case if there was no atmosphere). Only some of it is radiated back out into space. This stops the temperature of the Earth from dropping too low during the night. It is able to do this because some of the molecules of gas in the atmosphere are ‘greenhouse gases’. There is no definite boundary between the atmosphere and outer space. It slowly becomes thinner and fades into space. Three quarters of the atmosphere's mass is within 11 km of the planetary surface. People who travel above an altitude of 80.5 km (50 miles) are called astronauts. An altitude of 120 km (75 miles) marks the boundary where atmospheric effects become noticeable during re-entry. The Kármán line, at 100 km (62 miles), is also frequently regarded as the boundary between atmosphere and outer space. The temperature of the Earth's atmosphere varies with altitude (how high up you are! ); the mathematical relationship between temperature and altitude varies among five different atmospheric layers. The troposphere is the layer closest to the earth, and it is the layer in which we live. It is about ten miles deep. Seventy five percent of the mass of all our atmospheric molecules is in the troposphere, and this is where we find water vapour, dust, pollen, and soot particles. Weather happens in the troposphere. This layer is turbulent, with storms and atmospheric mixing. In the troposphere, the air cools gradually as it gets further from the earth. At the very top of this layer the air temperature is about -60 oC. Water vapour is therefore in the form of ice. This forms what we call the cold trap - a temperature region where water vapour rises no further (because it has solidified). If we had no cold trap, water molecules could rise higher and higher in the atmosphere are they would eventually break down into oxygen and hydrogen at the outermost layers - the small, light hydrogen molecules could then escape into space. Earth would lose its water if we had no cold trap! The stratosphere lies above the troposphere. The lower part of the stratosphere is cold, but it warms up as it gets farther from the earth. It is about twenty miles deep. 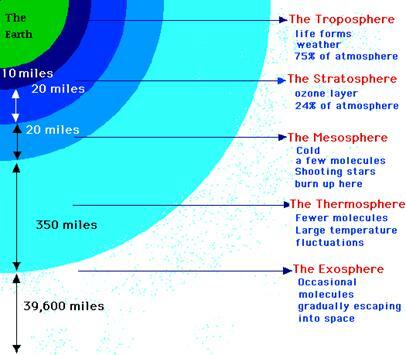 The stratosphere contains about 24% of the mass of all the atmospheric molecules. This layer has the ozone layer in it. The ozone layer protects life on earth from the high energy ultraviolet radiation emitted by the sun. See ozone depletion.